The impetus for starting bartlett mitchell happened when we worked for a large caterer. There was an incident involving two loyal team members who worked hard, yet the ‘rules’ meant we couldn’t show our appreciation of how much we valued them. Ian and I thought, we don’t want this to be representing us for another 20 years – we want to work for a company that’s all about food and valuing people. So off we went to set up bartlett mitchell! Witnessing the enjoyment of our #bmStars last week was a delightful reward for our instinct to set up a business all those years ago. It wasn’t just the winners that delighted us but the whole ‘bon amie’ buzz of being a true caring, sharing family and everyone being genuinely delighted to see their colleague’s success. It was such fun. The winners were people and teams that had really demonstrated living our FOODIES values. It was great to reward individuals and teams for delivering the difference. We also thanked our long service people. We had a fair few 15 year awards, which considering we are only 17 years old (and at 2 years only had a few contracts). It was great to see that so many enjoy still being with us. 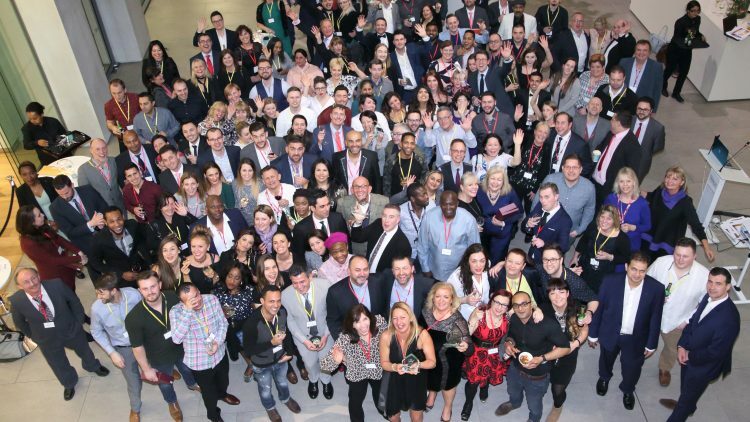 Our team turnover is relatively low so when it came to the 5 and 10 years awards it meant there were quite a few, and that’s just brilliant, as far as we are concerned. It was so nice to say thank you. The apprentices were inspiring in their fun and passion. They showed real commitment to delivering gorgeous food for the team. There are so many superstars ready to blossom within bartlett mitchell. It makes us so proud. When you see someone who joined as a kitchen porter, who then discovers a passion for food, and is proactive and willing to learn to become a great chef – it’s heartwarming. That takes us back to why we started. The Founders Award that Ian and I presented was given to a person who we recognised contributed a great deal to our success. There are so many people we could have given it to. So many people have been on the journey and contributed to our success story. However we narrowed it down to Hannah, who has been with us forever and has relentlessly created our bespoke tenders and been the font of all knowledge for so long. So much so that we actually really don’t know what we would do without her! In addition to this she has also inspired, driven – and created part of the bartlett mitchell DNA – the CSER within the company. She is a true green bee, so we were delighted to recognise her contribution. Most of all the evening was about saying thank you to old friends, meeting new people, making friends and it gave us an opportunity to reflect and enjoy why we all love working for bartlett mitchell!